If you aren't familiar with the quote above, you may not understand this manicure. It was spoken by the amazing Ron Swanson, one of the greatest characters on television, now or ever. Ron is known by many for his deadpan and masculine nature. He works in the city government of Pawnee, Indiana, on the comedy show Parks and Recreation. If you don't watch Parks, you are really missing out. 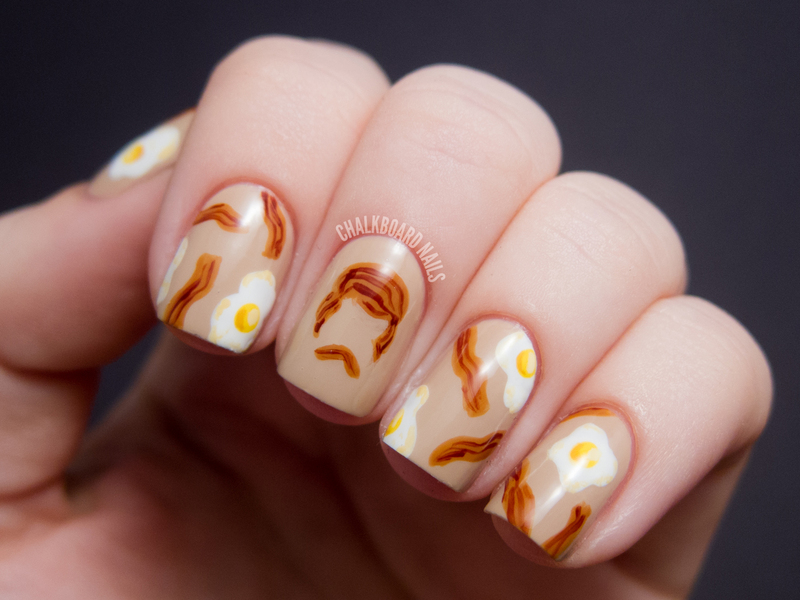 Ron has a deep love for breakfast food, so I tried to do him proud in this manicure by painting bacon and eggs all over my nails. The base for these nails is OPI Don't Pretzel My Buttons. The bacon is made using China Glaze Desert Sun and China Glaze Brownstone. The eggs are OPI Alpine Snow, China Glaze Happy Go Lucky, and a few mixes of Happy Go Lucky with other colors for the shading. I also made a silhouette of Ron's hair and mustache out of bacon. I like to think he would approve of this. 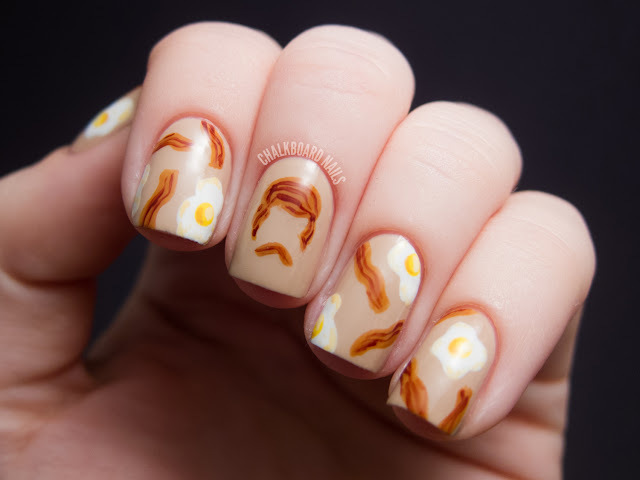 Ron's mustache is the stuff of legend, so I have also decided to make this my Movember manicure. If you're unfamiliar with Movember, it's a men's health initiative where men grow out their mustaches for all of November. Their mustaches help to spark conversations and raise funds for the often ignored issues of men's health. Here's a blurb from the Movember website. They also have a men's health page that is worth checking out and sharing with the important men in your life (or reading, if you are an important man). If you'd like to do a Movember manicure, you can also choose to associate your nails with a certain type of awareness by using a specific color. Testicular cancer's awareness color is orchid, while prostate cancer's awareness color is light blue. I'm pretty tickled by the breakfast print that I have going on with these nails. 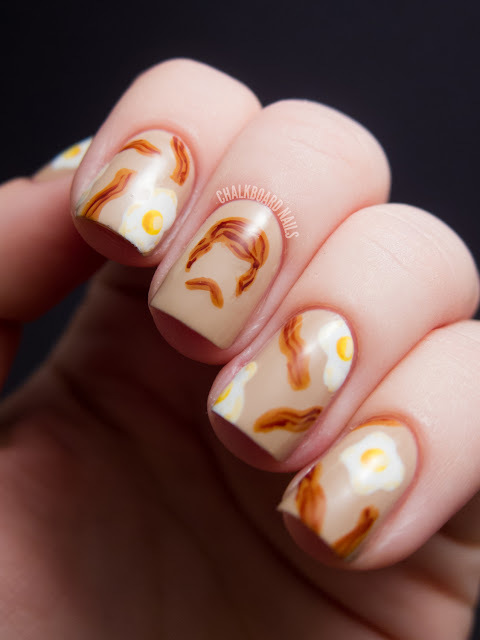 Bacon is one of my favorite foods and I do love fried eggs (especially on burgers, mmmmm). I hope I've done all you Ron Swanson lovers proud. I also hope you will take a moment this month to discuss men's health issues with all of the important dudes in your life. Dude I love these nails so much I can't even express it. I'm like legitimately angry that I didn't come up with them. They are PERFECT. EVERYTHING ABOUT THEM. And I definitely agree on the following points: a) Parks and Rec is an incredible show; and b) Ron Swanson would approve of his bacon hair silhouette. This is phenomenal. I absolutely adore this :) love parks and rec. It's the best and your skills are insane. oh wow these are wonderful! Awesome!! I love this show and love the nails! Brilliant mani for one of the most brilliant shows on television! i LOVE this. wow! :) i didn't even read the text but recognized ron immediately. absolutely perfect. These are making me really hungry haha. I LOVE Parks and Rec! The bacon silhouette is just genius. This should be the only way bacon is served - in the shape of Ron Swanson. I 100% agree! Some diner out there needs to get on this. Make a Ron Swanson plate. I'm not a huge Parks fan, though I do know the reference, but I have to say, I think this is the best nail art you've done so far. It's PERFECTION. Seriously looks like there's no way it could have been done by hand. Bravo! Oh please! you really blew my mind with this mani! I don't know about the character, I do not know about the show or anything, what I do know is that your creativity has no limits! I'm so pinning this! GREAT! 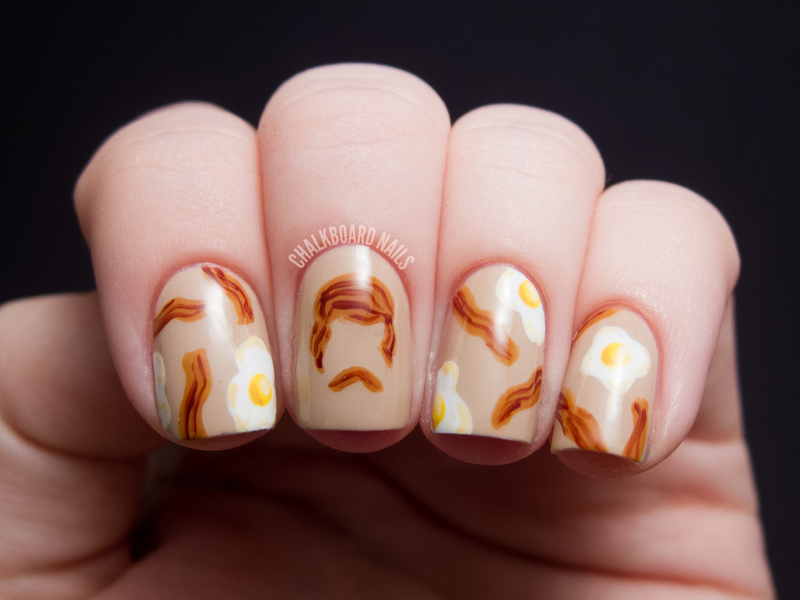 I have no idea who the character is but I adore the bacon and eggs! Cute idea. Ahahahahaha...(breathe)..lol, omg, this is fantastic!!! :D :D I love it! MMMm bacon! lol Love this and it's just cute beyond belief and makes a GREAT statement to raise awareness for men's issues!! I love you nails and I love Parks & Rec too. Its such a cute and creative paint job, double thumbs up! SO, So, so much to love! Bacon! Parks & Rec! Movember! I am so touched by this and in awe of your creativity and talent. LOVE them! Ron out of bacon is visionary :) Do you mind adding this to the InLinkz gallery (or if I do) so that everyone can show it off? These NEED to be seen! Thanks Melissa! I emailed you about the collection earlier but went ahead and added it now! Shut. The. Front. Door. I actually just started watching this on Netflix...hysterical! This is a fabulous mani!! Well done!! This mani made me LOL so hard!! This is serious perfection! Okay, you're a genius. This is officially the best mani ever. AND the best Ron Swanson quote ever! This is amazing Sarah!! I love it!! 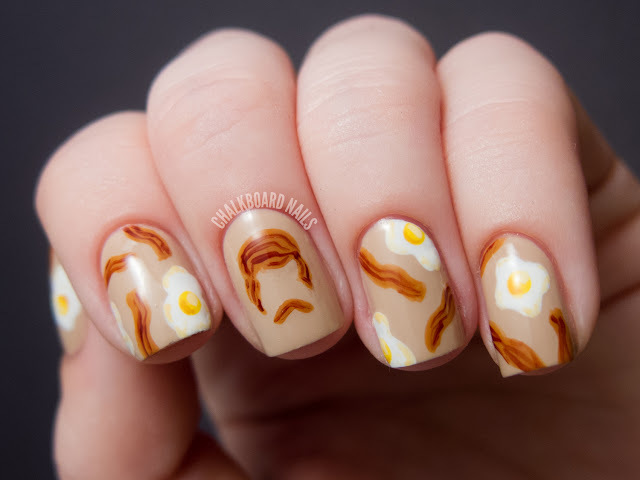 Best Movember mani of all time!!! This totally made my day. Ron Swanson is my hero <3 It looks great! omg this is the best thing i have ever seen! hahah amazing! OMGosh I'm DYING!!!!!!!!!!!! ♥ ♥ ♥ I love it! This is the greatest thing I have ever seen. And Ron Swanson is the greatest television character ever created. This is absolutely unique, funny & creative at the same time! At first I thought your middle finger was a big slice of funky shaped bacon, then I continued reading your entry and noticed it DOES look like Ron. Brilliant! SO this is pretty much the most awesome manicure I've ever seen. Just when I think there has to be a limit to the amount of creativity contained in one human brain, I look at your blog and - MIND BLOWN! Bacon? On nails? Umm, yes! This is so crazy amazing, I'm commenting on a blog for the first time. I love this so, so much. Ron Swanson forever! There are no words! 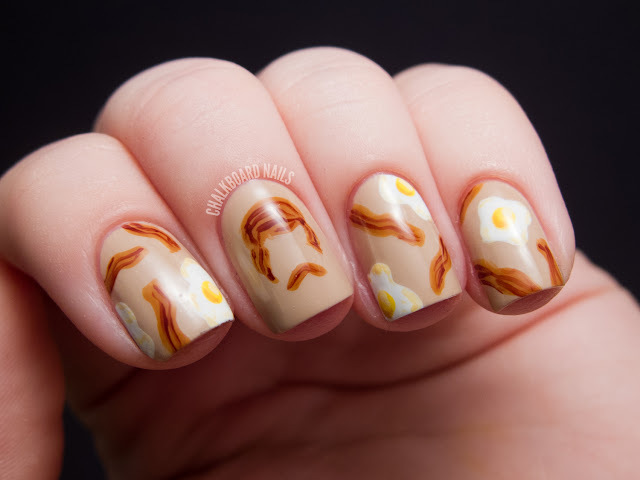 I love the bacon and Ron's face especially, who knew bacon would look so cute on a mani?! Really well done! Plus, I'm super-jealous of nails and shape, they're perfect! OMG, Jemma, do yourself a favor and check out Parks and Recreation. Ron Swanson is classic, and the rest of the show is pretty fantastic, also!